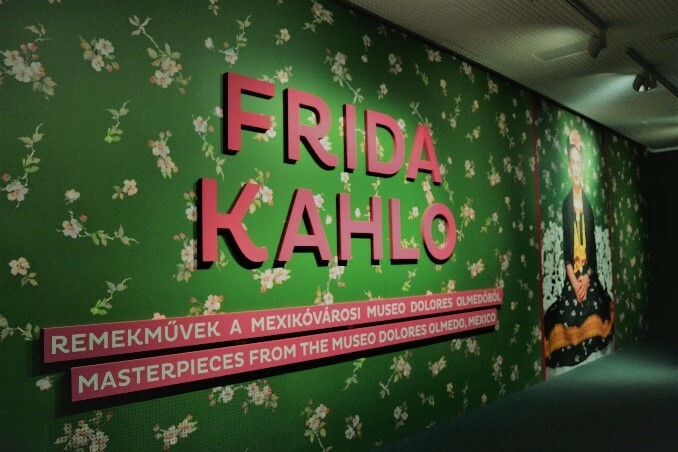 Once you step into the hall of the Hungarian National Gallery, you will be overwhelmed by a feast of colors where an imposing photograph of Frida Kahlo is exhibited in a vivid green hall; preparing you for a journey through Kahlo’s life. Renowned singer Chavela Vargas’ powerfully Mexican voice serenades visitors, introducing them to the life and work of one of the greatest icons of Mexican art. 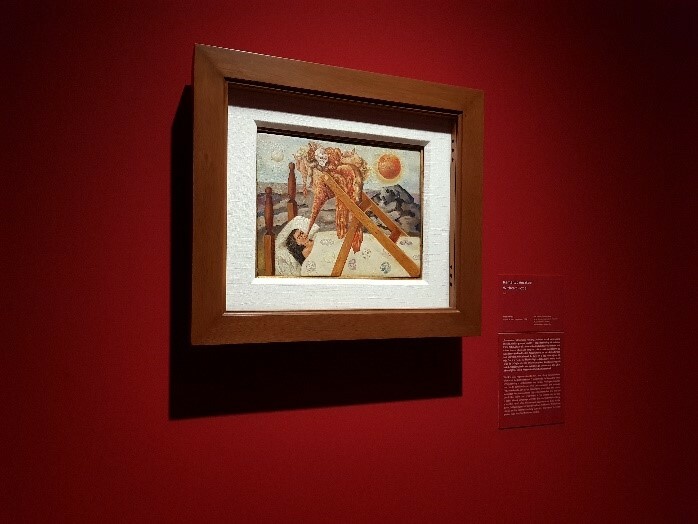 From July 7 to November 4, the gallery is hosting a collection of Kahlo’s artworks, most of which are on loan from the Museo Dolores Olmedo, home to the most extensive collection of the artist’s work. This is one of the biggest art events in Budapest this year, as it is the first time the artist’s work has been exhibited in Hungary. Frida Kahlo was born in 1907 in Coyoacán, Mexico, to a Mestiza mother and a German father. According to Kahlo herself, he father was of Jewish Hungarian descent, although this was refuted by a look into his genealogy. In 1925, she survived a tragic traffic accident that left her with a broken spinal column, collarbone ribs and pelvis, which confined her to bed for several months, ending her dreams of a career in medicine. While recovering, Kahlo started painting, producing her first painting on canvas in 1927, Portrait of Alicia Galant, which is currently displayed at the Hungarian National Gallery. The retrospective contains 35 artworks (26 paintings and 9 drawings). It is divided into five chapters, preceded by an introductory timeline of the artist’s major life events and followed by a section showcasing Kahlo’s effect on pop culture and the work of four contemporary Hungarian artists. The first hall ‘developing as a painter’ exhibits some of the early paintings, showing Kahlo’s style which was impacted by Italian renaissance. In addition, this hall shows the stylistic shift to more folkloric painting, encouraged by her lover and mentor Diego Rivera, as embodied by an intimate portrait of an indigenous Mexican girl. Following this chapter is a red painted hall, ‘poetry of pain’ that haunts the viewer with the discomforting images Frida Kahlo created, fueled by her suffering due to her injuries and miscarriages. This section contains a rare lithograph that showcases Kahlo’s accurate knowledge of anatomy, because of her earlier aspirations of becoming a physician. Furthermore, this hall contains a rare circular painting the artist completed the year she died. The third and fourth chapters focus on Frida Kahlo’s lesser-known still life paintings, their symbolism and her relationship to Mexico as a collector of folkloric works and as an activist. Lastly, the fifth chapter depicts Kahlo’s love life with her husband and lifelong lover, Diego Rivera, and some of her paramours. The gray walls contrast with the colorful collage made of excerpts from her diary – perhaps a metaphor of her complicated story with Rivera. 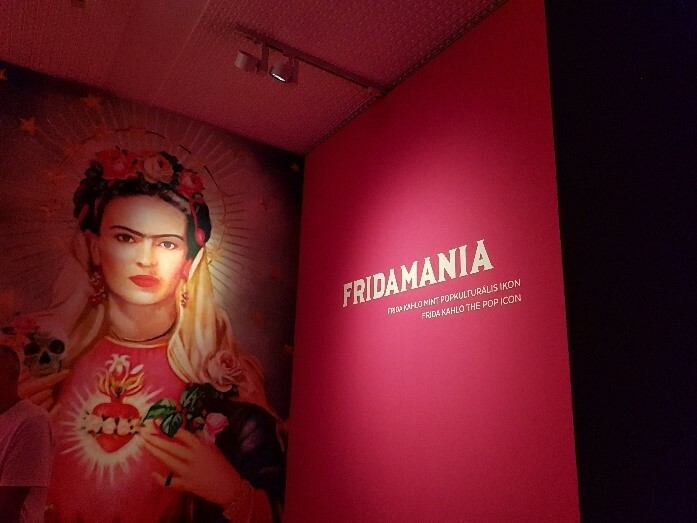 Whether it is Frida Kahlo’s work, personal life or influence on contemporary culture and art you are interested in, this exhibition is for you. With an excellently chosen collection, including her trademark self-portraits, less famous still lifes and sketches, accompanied by personal photos, quotes and excerpts from her diaries, the exhibition will engage you with the artist, her life and her culture.